Dashlane supports the FIDO Alliance™ Universal 2nd Factor (or U2F) and partners with Yubico – the company providing U2F YubiKeys. FIDO U2F is a simple and secure way to complete Two-factor Authentication, freeing you of the constant hunt for codes whenever you need to authenticate your Dashlane account. After adding a U2F Security Key to your Dashlane account, and with nothing else than a simple touch (depending on the U2F Security Key model you are using), your key will execute a public and private key exchange, successfully authenticating you into your Dashlane account. Your U2F Security Key will not replace codes generated by your Two-Factor Authentication app, but rather provide an additional layer of security and convenience. Dashlane is the first password manager to support U2F, an innovative and universal two-factor authentication standard, backed by Yubico and the FIDO Alliance. 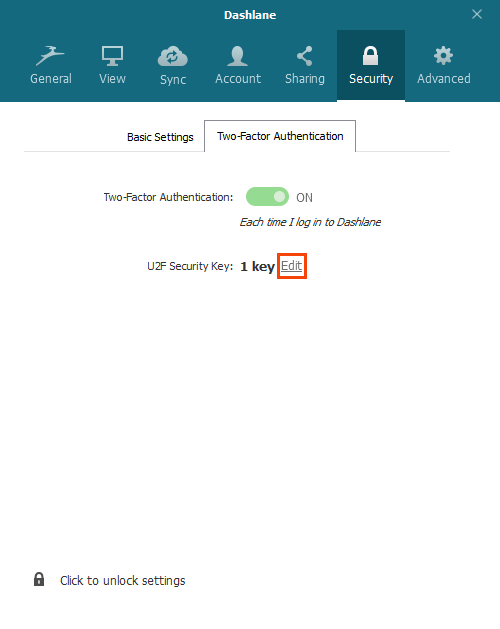 U2F is an open authentication standard that brings an extra layer of convenience and security to your Dashlane account by allowing you to complete Two-Factor Authentication (2FA) via a Security Key rather than with codes generated by a Two-Factor Authentication application. Real-time challenge-response schemes like U2F address OTP vulnerabilities such as phishing and various forms of man-in-the-middle attacks. As the legitimate server is issuing the challenge, if a rogue site or middle-man manipulates the flow, the server will detect an abnormality in the response and deny the transaction. You can also find more information on U2F and Dashlane with our Beginner's Guide to Using Two-Factor Authentication and U2F to Secure Your Passwords. In order to get started, you first need to have a Security Key that is U2F-compatible. You can purchase YubiKeys via Yubico's website. If you need help to choose your YubiKey, you can refer to this page of our Help Center! If you do not possess a Security Key that is U2F-compatible, you will not be able to complete the steps outlined below. If you possess a Security Key that is compatible with both OTP and U2F, we strongly recommend that you do not not use its OTP function to replace your Two-Factor Authentication app. Also, please note that Two-Factor Authentication via U2F is a Premium feature only. This means that you will only be able to add a U2F Security key to your Dashlane account if you have a Premium subscription. Pre 2.0 status and Premium trials do not unlock our U2F feature. 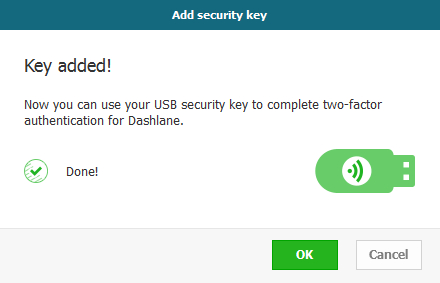 In order to add a U2F Security Key to your Dashlane account, Two-Factor Authentication must already be enabled. If you have yet to enable Two-Factor Authentication, please refer to the following article: How to enable Two-Factor Authentication step-by-step. To begin, please open the Preferences of your Dashlane app (from the Tools menu on Windows or from the Dashlane menu on Mac OS X), go to the Security tab and to the Two-Factor Authentication sub-tab, and make sure that Two-Factor Authentication is set to ON. Then click on the Add button next to U2F Security Key. You will then be able to choose a name for your U2F Security Key. After choosing a name, you will be asked to plug in your U2F Security Key and tap on the key button or gold disk, if appropriate. 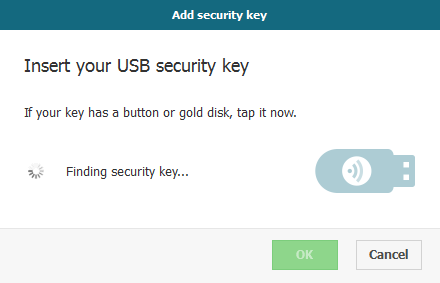 If your Security Key was already plugged in and does not have a button or gold disk, you will have to plug it out, and in again. A few seconds later, Dashlane will prompt the message below informing you that your U2F Security Key has been added. If you wish to review the keys that have been added to your Dashlane account or add another key, please click on the Edit button next to U2F Security Key. 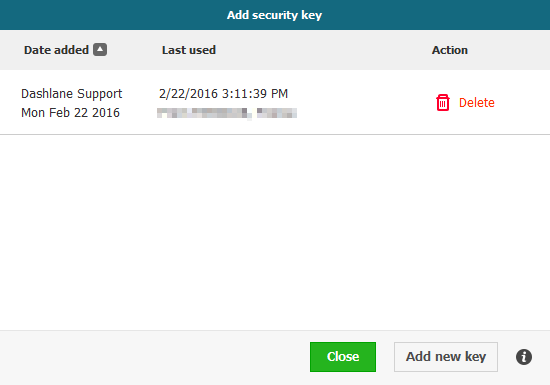 Now that Two-Factor Authentication via U2F is all set up, you can start using it! It is important to note that your U2F Security Key is absorbing whatever security level chosen when setting-up Two-Factor Authentication. Thus, you will need to authenticate with your Security Key either only when adding a new device, or each time you log in to Dashlane. If you wish to change this setting, please disable Two-Factor Authentication, and enable it again while choosing your preferred setting. More information here. 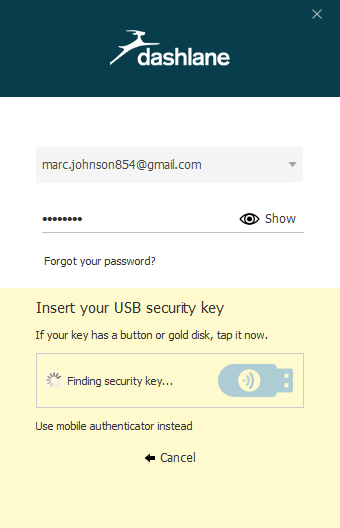 At last, insert the U2F Security Key that has been added to your Dashlane account and tap on the button or gold disk, if appropriate. If your Security Key was already plugged in and does not have a button or gold disk, you will have to plug it out, and in again. This can only be done from Dashlane on Windows or Mac OS X, and if Two-Factor Authentication is enabled for your account. 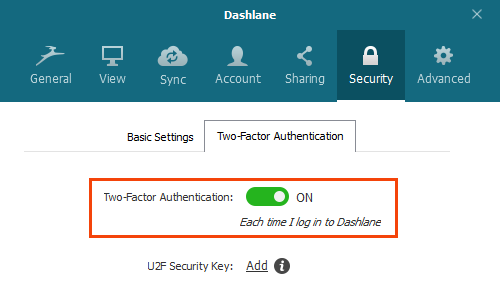 In order to remove an existing U2F Security Key from your Dashlane account, please go to the Security tab in Dashlane's Preferences, and to the Two-Factor Authentication sub-tab. From there, please click on the Edit button next to U2F Security Key. There, you will find a list containing all U2F Security Keys added to your Dashlane account. Simply click on the Delete button corresponding to the key you wish to remove. Please note that this will only delete the U2F Security Key from your account and will not disable Two-Factor Authentication. Click here for more information on the process to disable Two-Factor Authentication. 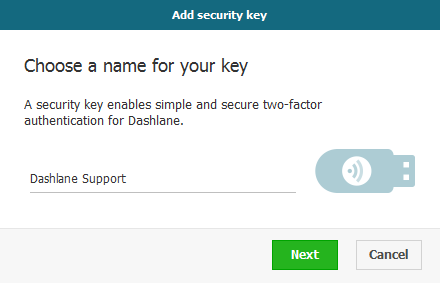 If you lost your U2F Security Key, you can always sign in to Dashlane with your Two-Factor Authentication app instead. 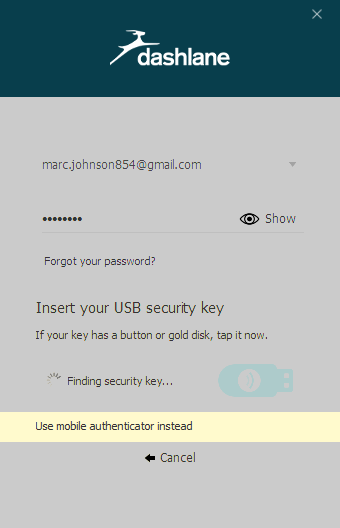 To do so, please click on Use mobile authenticator instead from the Dashlane login window. You will then be prompted to enter a code generated by the Two-Factor Authentication app you used to enable Two-Factor Authentication, as shown on the example below. If you do not have access to the device you set-up Two-Factor Authentication with either, please click here to review the list of options available to you!